Ivanka Paunova was born in Pazardzhik, Bulgaria, and received an M.A. degree in choral conducting, folk singing and folk instrument-gudulka pedagogy from the Academy of Music and Dance in Plovdiv. She is an internationally respected singer and conductor of Bulgarian-style choirs and a gifted teacher. From 1981 to the present she has taught gudulka and has performed with the Pazardzhik Ensemble as a singer and gudulka player. Since 1991 she has been the choir director of the ensemble. 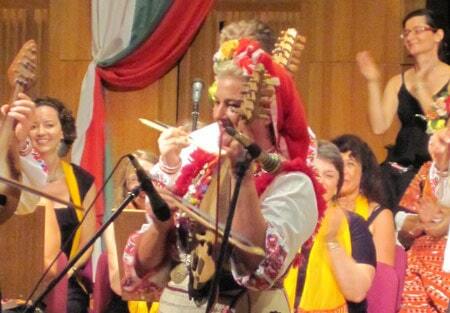 From 1983 to 1989 she performed as a singer and gudulka player with the Plovdiv-based Bulgarian Women’s Trio with bagpiper Maria Stoyanova and tambura player Yanka Dencheva, with whom she toured worldwide. Since 1989 Ivanka has sung with Les Grandes Voix Bulgares and has conducted for a number of singing groups from the Pazardzhik region, and has also coached the Danish Bulgarian choirs Sedyanka and Usmivka. Ivanka presently serves as an instructor of gudulka at the Paisii Hilendarski University in Plovdiv. She has sung with Trio Bozhura with Tzvetanka Varimezova and toured with them throughout Europe, Scandinavia, Russia and Canada. Currently she plays and sings with the trio Samodiva in Pazardzhik. Ivanka is featured in many recordings, including those of the Pazardzhik Ensemble, Plovdiv Women’s Trio, Trio Bozhura, Les Grandes Voix Bulgares, and the choir of the Plovdiv Academy of Music, Dance and Fine Arts.